Until 2010, there was an erroneous assumption that tests of the R-500 cruise missile are being conducted as part of the creation of the Iskander-K missile system, which in terms of auxiliary equipment is not only similar to the Iskander complex, but at the turn of 2009-2010 . after forming an understanding of the Iskander complex as a multipurpose modular missile system of the ground forces, it became clear that the R-500 cruise missile is only one of the firing means of the Iskander-M complex. Operational-tactical cruise missile R-500, developed by Ekaterinburg OKB Novator. The development of the R-500 rocket started in 1996. 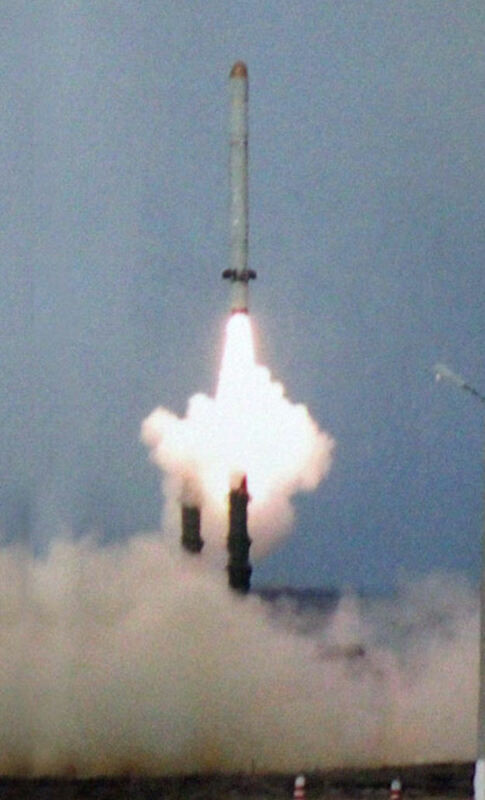 The high-precision cruise missile R-500 is used as part of the firing means of the Iskander-M complex and is displayed in a separate material, like a cruise missile. The first launch of the R-500 missile with SPU 9P78-1 was made at the Kapustin Yar test site on May 29, 2007. State tests of the complex began in 2008, and in 2009 they were put into service. Some 9K723 Iskander-M units have received the 9M728 (SSC-7) cruise missile as an adjunct to the 9M723 short-range (500 kilometer) ballistic missile. Iskander-K (K stands for krylataya or "winged") 9M728 cruise missiles has a flight altitude up to 6 km, automatic adjustment in the way, following terrain relief in flight to a range of 500 km. 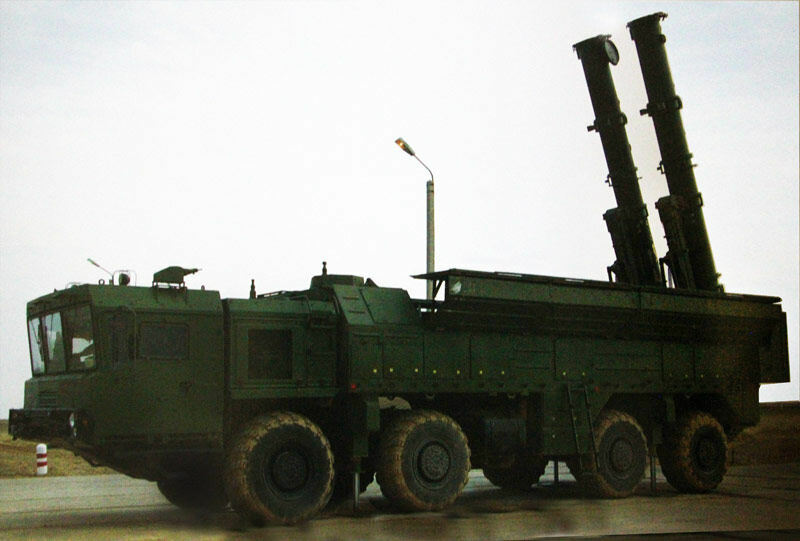 R-500 is a cruise missile, based and evolved from RK-55 3M10 and 3M54 3M14, Kh-101 102 ALCMs. In 2006, OKB "Innovator" successfully carried out a series of tests 9M82MV missiles, and in 2007, as a result of successful launches of cruise missiles 9M728 (OCD "Iskander") made the decision to move in 2008 to the final stage of testing. The "Caliber" cruise missiles can be easily installed on the multi-purpose missile system "Iskander-M", without prejudice to the agreement on the reduction of intermediate and short range. The multi-purpose missile system "Iskander-M" managed to solve the problem of accommodation of a Unified Launch Installation (SPU) for a ballistic missiles with its own system of aiming and for a cruise missile with its data entry systems before launch. The first entry in the topic was the launcher, which was shown at MAKS in 2009 and named "9P78 version 2". The unit has a modified body - increased its height and probably length. 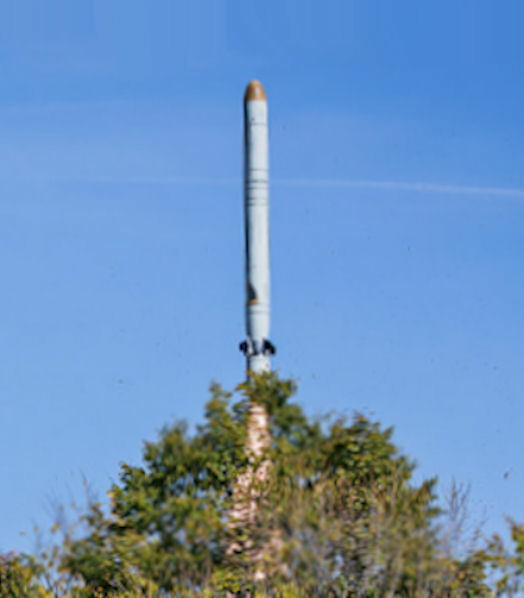 Missile 9M728 / P-500 standard are part of the complex "Iskander-M" have a length of no more than 6.5 m. In general, judging by the photos, they are like a rocket complex "Caliber-NK" for work on ground targets in the export performance 3M14E. The same, or very close to it in appearance and layout. 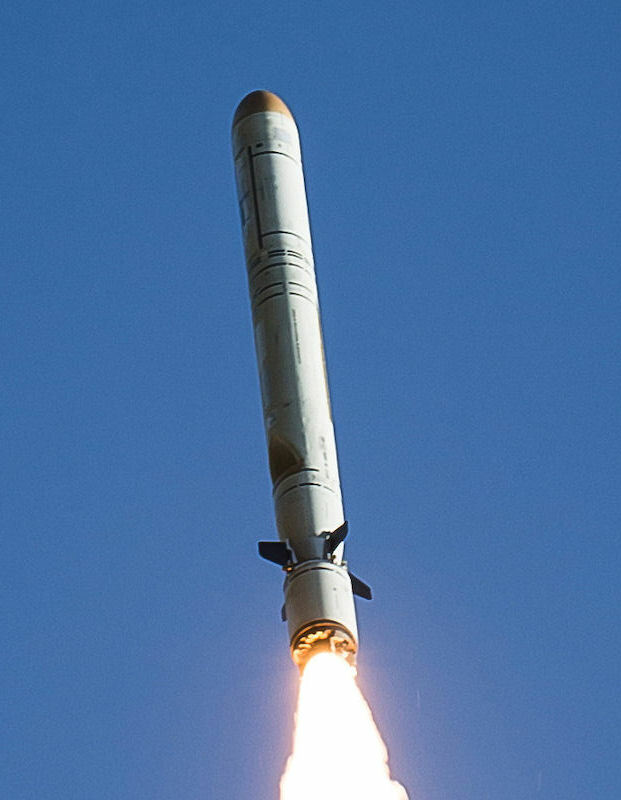 The range of these missiles is officially 300 km, and not more than 500 km in connection with the reduction of the INF Treaty. The inertial rocket control system with trajectory correction in the areas of correction by the method of correlating a digital terrain map with radio altimeter data using optical correlation seeker 9E436. The principle of operation of the homing systems, which have the scientific name of correlation extremal, is that the optical equipment forms an image of the terrain in the target area, which is compared in the on-board computer with the reference one, after which corrective signals are issued to the missile controls. The rocket control system is built on the basis of a gyro-stabilized platform (GSP) and a digital computer. The warhead is inseparable. The guidance system of the launch aggregate of the complex interacts with space navigation systems such as NAVSTAR and GLONASS. Input of target data into the rocket takes place automatically when the rocket is in a horizontal position inside the SPU, using the advanced optical system for setting the GSP and entering the numbers of the flight task in the onboard computer for rocket using a laser optical device. Entering data about the goal takes little time and before the start, the data about the goal can be corrected for information from an external source. The starting Engine is solid propellant and the cruise ["marching] engine is a compact TRDD brand TRDD-50BE. The propulsion engine TRDD-50BE was developed at OMKB jointly with NPO Saturn and produced at the Omsk Engine-Building KB and NPO Saturn. Serial production of engines in full volume at OMKB capacities for the R-500 rocket was officially launched in February 2009, but the production of TRDD-50BE engines was already in progress as of 2005. The maximum production capacity of OMKB for 2006 is 117 pcs per year. (for 2007 - 100 units, 2008–2009 - 137 units). The engine is probably a modification of the TRDD "product 37", created on the basis of the family TRDD-50 (1979). The publication of "Iskander can not fail" (Red Star on 10/04/2015) reported that after the Field Academy course at Kapustin Yar, the 92 Missile Brigade of the Central Military District prepared for the strategic exercise "Center-2015" and started the teaching of standard rockets. On 19 September 2015 missile troops of the 2nd Guards Army completed the strategic command-staff exercise with the first launch by combat troops of the CVO 9M728 missiles. It happened in the Ural steppes Donguz test site. Its range - 80 km, the northern border - 20 km south of Orenburg. This is the time allowed for the test is successful operational-tactical missile complex "Tochka-U". Now for the first time in the sky over Donguz the new combat missile complex OTP "Iskander-M". This was in the long tradition of military rocket launches entrusted to the best "startovik". Since the beginning of the school year for the honor all start fighting battalions and batteries, all 12 rocket launchers were commanded by Colonel Andrei Surkov. Only two days before the final Brigadier teachings became known that the right of launching regular rocket was the first division of Major Edward Borchaninova, the second launching battery of Zhirnova Captain Constantine and first lieutenant Said Ahrieva. Together, they took from the lieutenant Alexander Gordeyev of rocket-technical battery the sealed transport and launch container with a dimensional weight and electrical layout, and to combat rocket, onboard equipment that will test the calculation of the machine regulation and maintenance of captain Noilya Akhmerova. The signature on the form missiles - and the cylinder transport and launch container immediately from transport-charging machine migrated to guide a rocket launcher compartment. Finally, it sounded the familiar to missile command "launch from the shelter. Fire number one." A cruise missile tore into the white cirrus clouds overcast the sky and headed to the invisible target of 47 km from the launch pad. Soon followed intelligence report: the missile's cassette warhead destroyed the targets. The Iskander-K system was tested on 29 May 2007. The missile was launched from a modified Iskander launcher and flew at 250 meters/second for 24 minutes at an altitude of 100 meters. 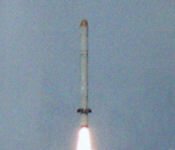 The missile also performed several maneuvers during its flight, suggesting a countermeasures capability. Making the [obviously flawed] assumption of constant speed the quoted figures give a range of approximately 224 miles / 360 km. 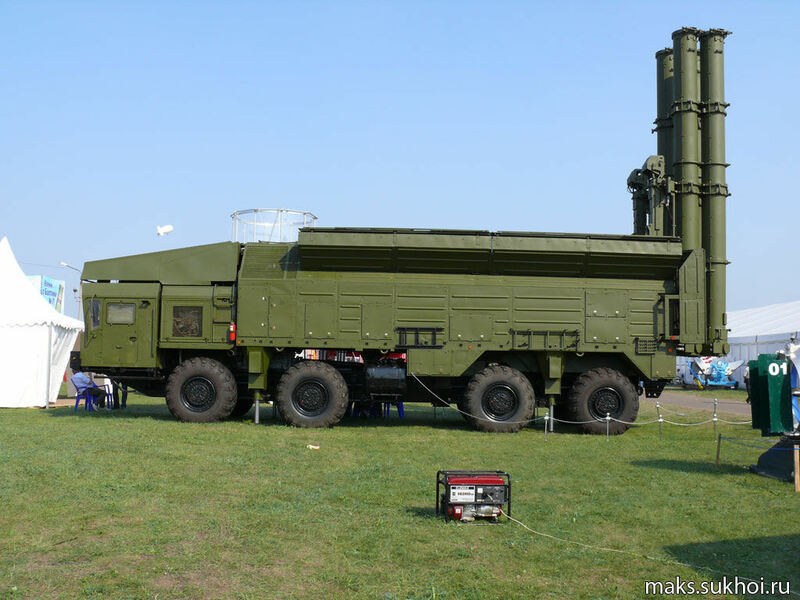 R-500 tests was to be finished in 2008, whereas in 2009 these missiles was to be used to equip the Iskander tactical missile systems. 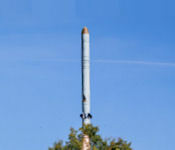 The tests of the new missile took place at the Kapustin Yar site in the Astrakhan Region of Russia. First Deputy Prime Minister Sergei Ivanov said that R-500 was a high-accuracy missile, capable of destroying ballistic missile defense systems and air defense systems. Ivanov also said that “these tests were preliminary and it is very pleasant to realize that they were successful”. 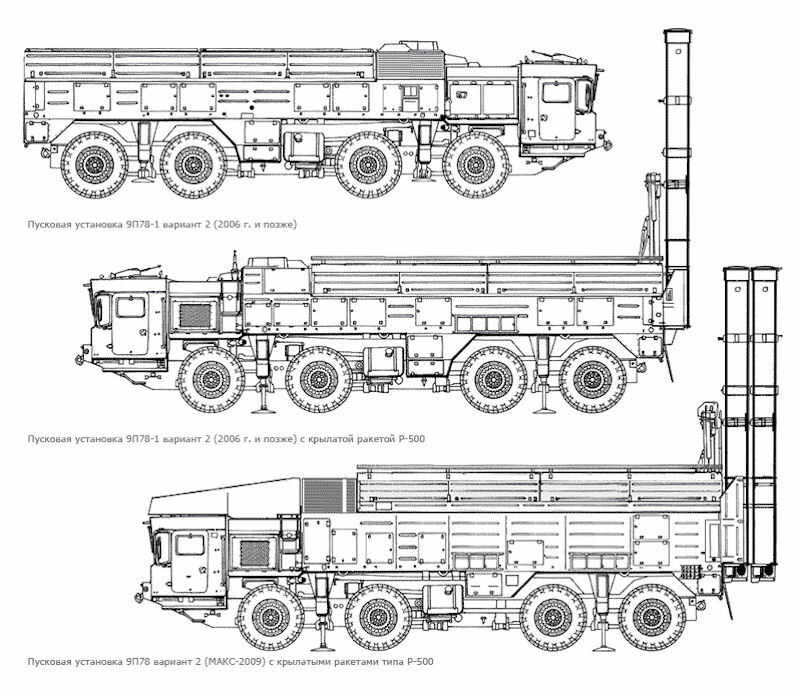 At MAKS-2007 a modified Iskander launcher was displayed with four long and narrow launch tubes that, according to Vympel on this site, are for the Club-M missile. 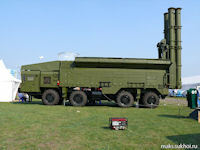 The four-tube launch vehicle seen at MAKS 2007 is the Morinformsystem-AGAT Club-M coast-defence system, which was selected in preference to a design proposed by NPP Start, from Yekaterinburg. The latter was shown at the International Maritime Defence Show (IMDS) 2005 at St Petersburg between 29 June and 3 July 2005. The prototype uses a chassis based on the MZKT-7930 8 x 8 vehicle, and the capacity of four rounds was dictated by weight restrictions. The definitive version will have six rounds, and be able to fire 3M-54KE and 3M-54KE1 anti-ship missiles and the 3M-14KE land-attack missile. 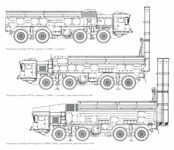 Like the prototype, the entire system – SPU (Samokhodnaya puskovaya ustanovka) launching vehicles, the MSU (Mashina svyazi i upravleniya) communication and control vehicle and the TPM (Transportno puskovaya mashina) transporting and launching vehicle – will use the MZKT-7930 wheeled chassis. While various of the Club missiles can be carried on the Iskander TEL, to some observers the missile did not seem a very promising candidate. At MAKS 2007, CLUB-M was being described as ‘primarily for the export market’.